To start a full filesystem scan select Analyzer → Scan Filesystem from the menu, or press on the Scan Filesystem toolbar button. When you run a full filesystem scan, Disk Usage Analyzer window will start drawing the tree as soon as the thread starts scanning the filesystem. If any large partition is mounted on the filesystem, that will be scanned too. 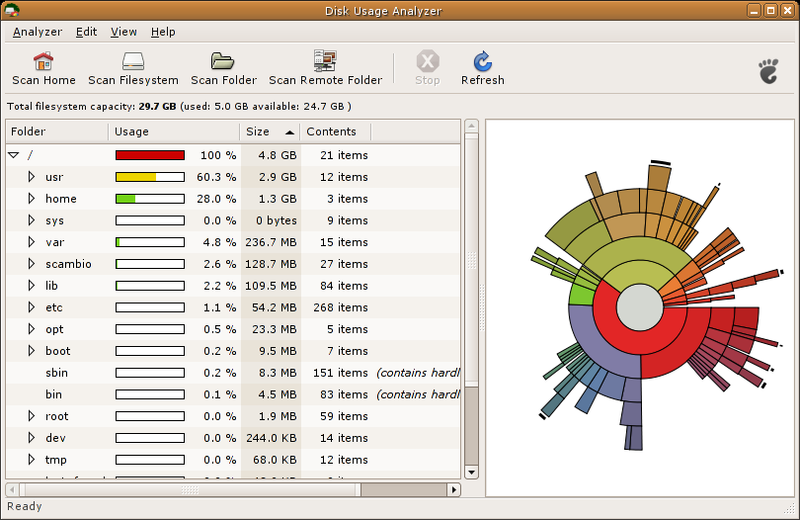 Disk Usage Analyzer will display sizes in the directory tree as allocated space. This means that the displayed sizes refer to the actual disk usage and not to the apparent directory size. If you want to view the apparent file size, uncheck View → Allocated Space . Disk Usage Analyzer will not count the /proc dir, nor any file size that is not related to a "plain" file, so symlinks, character blocks, device blocks will not be part of the directory size. Hard-links are managed in a different way: this first hardlink is counted as a normal file, while the subsequent links to the same inode device are not counted in the total, but highlighted in the right-hand column of the window. To start a single folder scan select Analyzer → Scan Folder... from the menu, or press on the Scan Folder toolbar button. 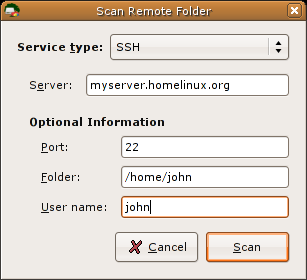 If you need to scan a remote server-folder, just click on the toolbar icon Scan Remote Folder or select Analyzer → Scan Remote Folder from the menu and you will get the following dialog box. Disk Usage Analyzer can connect to a server through ssh, ftp, smb, http and https.